Check before you eat many of the fruits. WAX is being used as preservation Purposes and then cold stored. You might be surprised especially apples from USA and other parts are more than one year old, though it would look fresh. Becox wax is coated preventing bacteria to enter. So it does not get dry. 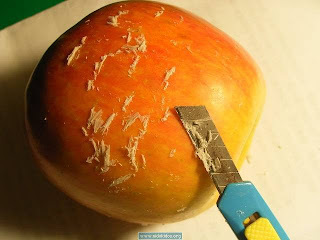 Eat Apples after taking the wax as demonstrated in the picture.